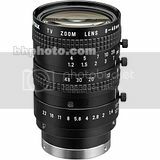 I wanted to know if anyone has experience with C Mount Lenses. I was looking at some different lenses and really don't understand the difference between the CCTV, 16mm, 2/3" C Mount Lenses and if they can work with the GH1. I also noticed that they make mention of some Lenses being 1" or 1/2". What does this mean for use with a GH1? I have one CCTV lens that is designed for a 1/2" sensor. When the GH-2 is used in 1080p mode, and the Extended Teleconverter (ETC) mode is set to on - using a 1920x1080 pixel array in the middle of the sensor, the image coming through the lens fully covers the shrunken area used by the ETC mode. Therefore, a lens designed for at least 1/2" can be used in one of the 1080 video modes with ETC turned on. I have not yet used any other C-mount lenses or 2/3" lenses. You should go with a lens that covers 1" at least, which covers about the area of the 4/3 sensor. Anything smaller will vignette and you'll have to use ETC, and anything smaller than 1/3" won't even cover that. But the GH1 and GH2 have the wider sensor, and even my pentax 25mm 1.4 that covers 1" vignettes slightly. Thanks for the help. So the lens made for 2/3" would probably also have to be used in an ETC mode I guess. I need to do a bit more research on these lenses and learn more about the different models and features. Good to know some have actually used these guys with the GH cameras. I take it that you have to crop edit in post somehow to deal with Vignetting? I usually letterbox the footage to 2.39:1. @Teki, so you go with a Wide screen ratio to trim off the vignette area or is this just a preference for the look you want anyway? If you have any examples on line i'd love to see it. @Aria Both really. Vignetting is still visible even after the crop, but there won't be any hard vignetting(black), just darkening of the peripherals. Here is a short clip for you. @Teki, THANK YOU! That made it crystal clear :) So as was brought up before really it seems that 25mm is about the limit where you'll get some Vignetting, but move up to 35mm Lens and above and you could get some solid footage minus the Vignetting? Hey just got an idea in my head, would it be worth a shot to see if a tele-converter lens might shift the focus out enough to get past the Vignetting? Maybe something like a 1.4x? @Teki Could you post some pictures with pentax 25 1.4 from a white wall that clearly shows the vignetting in non ETC mode? Is it correctable in post or already to strong? Guess vignette is a bit worse on Gh2 due to the oversized chip? Yep, you should use a 1" lens, and that means anything greater than 35mm would be a safe guage. 25mm lenses are still possible, but there will be slight vignetting. I have a 75mm TV lens that I adore and use regularly. No vignetting, and tack sharp wide open. The C mount to m4/3 adaptors you buy off the net, even those made in China, are usually good, and have allowance built into its design for focus beyond infinity. @Kazuo, i'm confused. Why is the focal length of the lens making a difference in vignetting if it's actually the image circle of the Lens itself being too small that is causing the problems? Do the 35, 50 or 75mm C mount lenses have larger image circles? Sorry I didn't make myself clear. The vignetting has absolutely nothing to do with the focal length. I was just thinking aloud cos I was concerned about infinity issues when I bought my lens. Apart from vignetting, many who have tried using CCTV lenses on m4/3 have had issues with focus to infinity. Take the 75mm lens I have for instance. Before i took the plunge, I was scouring for info online, and came across several users who had to literally saw off some parts of the rear of their lenses. Apparently there was this piece of metal that protruded and affected the flange distance. I took a risk, and bought the lens, and am glad I did. There was no such thing, and I also found out later, that my worries were unfounded, cos the adaptors that are widely available in the marketplace are designed in such a way there will always be enough allowance in the flange to help you get past infinity. Lesson learnt form all this: help online is useful, and in abundance, but sometimes, there are also detractors. You just have to dig it in, and find things out for yrself. It's all part of the experience! Well I think there is some validity to the flange distance affecting focus. I have three C mount lenses (two CCTV and once Super 8mm) and only one focuses to infinity. I'm using the newest hawk adapter, which is considered a very good C-mount to m43 adapter. I'm considering sending out the two lenses that don't focus for flange mods. I have a number of c mounts, CCTV lenses, my favorite are the 2 rainbow para focal zooms.. 8-48mm f1.0 and the 11-69mm f1.4 they both have focal adjustments on the lens nice and cheap usually. The 11-69mm is made for 2/3" so it is longer than 69mm 1/2", this lens requires no mods to use. The "h6x8" 4-48mm is a 1/2" and its a bit soft at f1.0 but at f1.5 it is good.. that lens takes a really easy mod to get to seat properly.. I also picked up a 8-48mm rainbow that was the "h6x8 II" that was easily moded simular to the "h6x8" also, same basic lens as the "h6x8" but more metal construction than the mainly plastic "h6x8"
other than those I love the Tamron 4-12mm f1.2 for super wide almost fisheye shots. easy mod to get it to fit.. I also tried a prime 3.5mm Rainbow f1.6 took a bit of heavy moding but works well, nice sharp wide prime lens but the mods are drastic to get it to work. i think most of those lenses are hard to mount, some have to be tweaked somehow. there are many cheap options but who knows what are a 'safe bet' in terms of extra modification to m4/3? i would be glad to know what lenses just need an adapter without any modification. Looking at a Navitar 25mm f0.95, 1" sensor...would this vignette? @Ebacherville, can you give details how you modified the Rainbow H6x8II? I'm trying to think of ways to mod it without using glue. So far I'm thinking of an attempt to drill 3 holes into the c mount adapter and use that in place of the black metal ring, and screw the adapter directly onto the rear lens after threading the c mount all the way in. This way if it doesn't work, I'm only out a c mount adapter.